A proprietary blend of a finely powdered mixture of all organic ingredients designed to be ingested and passed through the gastrointestinal system in order to dynamically absorb an array of toxins, impurities and dislodge mucoid plaque. 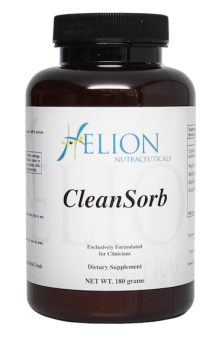 By combining the power of Bentonite Clay and Psyllium Husk CleanSorb has a powerful infinity for absorbing and locking up more than 100 times its weight unhealthy compounds that may be contributing to bowel inflammation and irritation. This blend is useful in calming bowel irritation, relieving constipation, clearing diarrhea and supporting bowel detoxification programs. Organic Bentonite Clay: Natures own amazing purification aid, Bentonite Clay is able to absorb 40 times, or more, of its own weight in toxins, bacteria and parasites, which attracts and binds like a magnet. 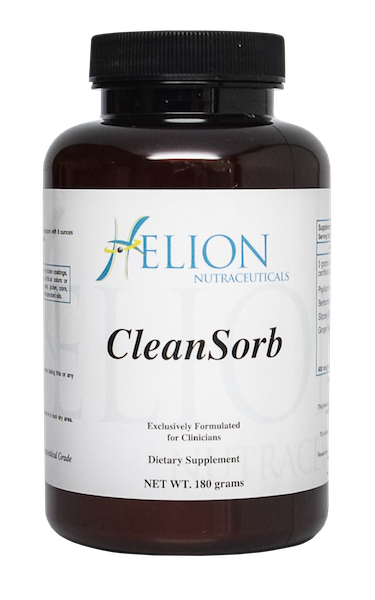 Combined with organic Psyllium Husk Powder provides for a beneficial sweeping through the intestines and binding toxins, effectively removing plaque, debris, and binds to heavy metals to assist removing toxins from the body. Organic Psyllium Husk Powder: Psyllium soaks up a significant amount of water in the digestive tract, thereby making stool firmer and, under these circumstances, slower to pass. Psyllium also has the additional advantages over other sources of fiber of reducing flatulence and bloating. It may be recommended by a physician to help soften stool and reduce the pain associated with hemorrhoids. Organic Slippery Elm Bark: Long considered one of the best possible herbal compounds for reducing inflammation of mucosal tissues. This tree’s inner bark is rich in mucilage, a spongy, slippery fiber that soothes skin and coats the mucus membranes that cause irritation. It not only as a most soothing and healing action on all the parts it comes in contact with, but in addition possesses as much nutrition as is contained in oatmeal. Organic Ginger Root Powder: Historically ginger has a long tradition of being very effective in alleviating symptoms of gastrointestinal distress. In herbal medicine, ginger is regarded as an excellent carminative (a substance which promotes the elimination of intestinal gas) and intestinal spasmolytic (a substance which relaxes and soothes the intestinal tract). Modern scientific research has revealed that ginger possesses numerous therapeutic properties including antioxidant effects, an ability to inhibit the formation of inflammatory compounds, and direct anti-inflammatory effects.